The Minnesota Attorney General's Office and 3M agreed on a settlement amount of $850 million to settle a lawsuit filed in 2010 over industrial groundwater contamination. The Attorney General had sought at least $5 billion in damages from 3M for the company’s disposal of industrial chemicals -- including PFCs, which are bioaccumulative and harmful chemicals that can build up over decades and increase rates of cancer and birth defects -- in the Twin Cities Metro Area over the past 40 years. The $850 million will be provided to the state as a grant to fund clean drinking water and natural resource projects. The settlement only covers damages to natural resources. The Attorney General's office stated that it has no jurisdiction to recover damages for personal injuries. 3M settled more than 3,500 personal injury suits last year, paying out more than $671 million. The revisions to the proposed Groundwater Protection rule include voluntary and mandatory nitrate reduction practices in areas with high nitrate concentrations in public water supplies. The update comes after numerous public meetings and a comment period on the initial draft that was informally published by the Department of Agriculture in summer 2017. The Minnesota Department of Agriculture (MDA) announced a new collaboration among the MDA, Cedar River Watershed District, CFS Cooperative, Hormel Foods Corporation, Land O'Lakes SUSTAIN, the Environmental Initiative, and the Mower County Soil and Water Conservation District. This public-private partnership, aimed at reducing flooding and improving water quality in the Cedar River watershed located in southeastern Minnesota, grew out of an agreement to enhance the state's water quality signed in 2016 by Governor Mark Dayton and Land O'Lakes. The partnership will engage CFS Cooperative, Land O'Lakes, and farmers located within the Cedar River Watershed to enable more precision agricultural practices and lead to farmers' participation in the voluntary Minnesota Agricultural Water Quality Certification Program, a 10-year guarantee of regulatory certainty in exchange for farmer-implemented conservation practices. Land O'Lakes and CFS help farmers become certified through direct education and technical assistance. The MN Board of Water and Soil Resources (BWSR) released an updated final draft Model Watershed District Buffer Rule on January 18, 2018. In December 2017, BWSR reported that 97% of lands adjacent to public waters and 93% of all lands subject to the buffer law are in compliance with the law. The date by which lands adjacent to public ditches must be in compliance is November 1, 2018. No compliance date extensions are expected at present. The first reporting deadline for the buffer implementation program was January 1, 2018 for water management authorities. BWSR will update compliance information after reviewing submitted reports. Water management authorities must add "other watercourses" identified by Soil and Water Conservation Districts to their local water plans by July 1, 2018. On January 22, the Supreme Court held that all lawsuits challenging the Clean Water Rule must be brought in U.S. District Courts. The decision resolves the procedural question about where challenges to the Clean Water Rule should be filed. The Clean Water Rule, published in 2015 by the Environmental Protection Agency (EPA) and the U.S. Army Corps of Engineers (USACE), clarifies water resource management in the United States under the Clean Water Act (1972). The Supreme Court's ruling concludes efforts made under both the Obama and Trump administrations to obtain a ruling that would have permitted a challenge to the Clean Water Rule to be brought in the U.S. Circuit Courts of Appeal. The Supreme Court considered the issue on appeal following an October 2015 decision by the U.S. 6th Circuit Court of Appeals to issue a nationwide stay of the Clean Water Rule, issued by the Obama administration and also known as the Waters of the United States rule, or WOTUS. The Clean Water Act language at issue prescribes judicial review of rules within the Clean Water Act. The Act states that U.S. district courts will hear rule challenges except in the case of seven types of actions by the EPA designated for direct review by the court of appeals. In a unanimous decision, the Supreme Court held that the WOTUS rule does not fall within the types of challenges that may be filed in the U.S. Circuit Courts of Appeal. The result of this decision is that the 6th Circuit did not have jurisdiction to hear the WOTUS rule challenge or to issue the 2015 stay of the Clean Water Rule. While the Supreme Court considered the WOTUS rule judicial review jurisdiction question, the Trump administration is taking steps to repeal and replace the WOTUS rule. The EPA and the USACE have proposed to repeal the WOTUS rule (and to impose a moratorium by rule) that would prevent enforcement of the WOTUS rule until 2020. The federal government is taking these actions so that the WOTUS rule can not be applied as law even if the 6th Circuit's stay is lifted. On May 30, 2017, Governor Dayton signed a tax bill and an environment omnibus bill that will provide “Riparian Aid” to watershed districts and counties that elect jurisdiction to enforce the Buffer Law. $8 million has been appropriated for fiscal year 2018 (which starts July 1, 2017) and $10 million for 2019. To be eligible for Riparian Aid in the coming year, a watershed district or county must file with the Board of Water and Soil Resources, by 4:30 p.m. on June 28, 2017, a signed resolution accepting jurisdiction to enforce the Buffer Law and a point of contact. BWSR will estimate the funding available to a watershed district if the watershed district provides data on the total miles of public drainage ditches in the watershed by 4:30 p.m on June 14, 2017. Watershed districts have been partnering with golf courses, city parks, and school districts to construct stormwater harvest and reuse projects. The regulatory burden on these projects will be a little lighter, as the 2017 Legislature exempted stormwater reuse projects from the requirement to obtain a DNR water appropriations permit. Harvest and reuse projects reduce use of drinking water for simple irrigation, and more policy work to help support such efforts is yet to come. The Clean Water Fund Water Reuse project involves an interagency work group that is expected later this summer to recommend further measures to promote successful reuse projects. 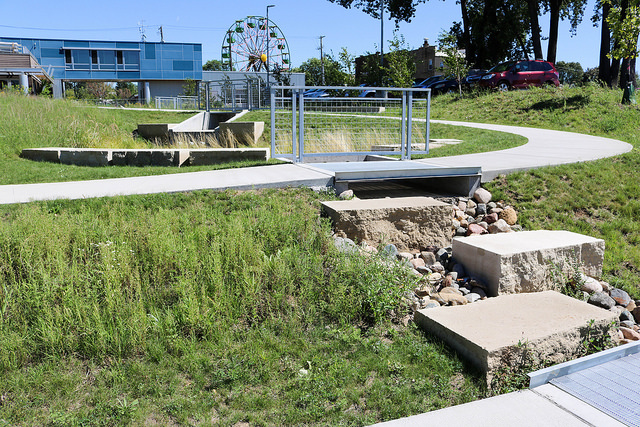 For a look at stormwater reuse projects around Minnesota, view our gallery. The 2017 Legislature added "special taxing districts" to the list of entities that must under the Truth in Taxation law submit their proposed tax levy to the county auditor by September 30 for the following year. Watershed districts are included in the definition of "special taxing districts," but already have a longstanding deadline to adopt a budget and certify a tax levy by September 15. We are advising our clients that the September 15 date is still the one to follow. Magner is a research professor in the University of Minnesota’s Department of Bioproducts and Biosystems Engineering, with a passion for seeing water improve in Minnesota and for passing on his water ethic that kept him in the field after a 34-year career at the Minnesota Pollution Control Agency (MPCA). Partnerships require thinking beyond landowners and government entities. “We are trying to reach out and engage in more public private partnerships,” explains Magner. “The private sector can take a proactive stance of thinking beyond winners and losers, in terms of who is regulated and at what cost, and recognize the value of a high quality of life for all.” Magner sees the biggest partnership opportunity with private partners in rural areas. In addition to this work, Magner and his students are focused on several multi-year projects showcasing the benefits of water management plan implementation at smaller scales (acres up to a few square miles) to help inform the state’s use of best water management practices. They are also tackling a new project to help the Board of Water and Soil Resources link targeted watershed funding with the statewide One Watershed, One Plan program. “I have seen ‘watershed’ become a more common term in how we talk about water; however, defining watershed for the general public is a bit more challenging. Nevertheless, it is exciting to see watershed thinking and vocabulary used around a kitchen table,” notes Magner of a change he has seen in his 38 year—and counting—career in water resources. According to Magner, one of the biggest challenges facing Minnesota’s water resources is learning how to adapt to the way that rainfall magnitude and patterns are changing, and understand the implications for land and water management. “Until recent, we’ve been using return periods from 30-year moving averages of precipitation and runoff,” comments Magner. “Based on what we’re seeing and what climatologists have predicted in terms of cooler, wetter springs and summers, we need to learn how to adjust our expectations in both urban and rural settings.” Magner provides the example of culverts in rural watersheds, once sized appropriately but increasingly too small to handle bigger rain events, and the resulting issue of water flowing over roads or blowing holes below the culvert. Federal District Judge Ann Montgomery’s recent decision in Hawkes Co. v. Army Corps of Engineers reflects a judicial desire to see the Corps apply the Kennedy test based on a sound record, and impatience with the impact of the Corps lengthy process on land owners. Louis Smith reviewed these and other developments in Water Law yesterday, April 20, 2017, at the annual Minnesota Environmental Law Institute. The direction to follow Scalia’s opinion in Rapanos would mean shifting the definition away from Kennedy’s “significant nexus” test. To discern the details of a Scalia test, commentators have pointed to Scalia’s preference for direct surface connections between waters, and for “relatively permanent, standing or continuously flowing bodies of water” as opposed to “channels through which water flows intermittently or ephemerally, or channels that periodically provide drainage for rainfall.” Since Rapanos, Circuit Courts of Appeals find jurisdiction when Kennedy’s test is satisfied, or when either Kennedy’s or Scalia’s test would be satisfied, but no published opinion has ever held Scalia’s test alone governs. Until there is a new rule, the Eighth Circuit continues to follow U.S. v. Baileyand consider jurisdiction valid if it satisfies either the Kennedy significant nexus, or the Scalia direct surface connection test. The Seventh and Eleventh Circuits have held that Kennedy’s test alone governs. The First, Third, and Eighth Circuits have held that jurisdiction is proper if either Kennedy’s or Scalia’s test is fulfilled. The Fourth and Ninth Circuits have applied Kennedy’s test, but without ruling whether Scalia’s test should be used in the future. The Fifth and Sixth Circuits have applied both tests, but without ruling whether one or both should be preferred in the future.